Vlog of our trip to Florence! After 10 years of interviewing tons of great artists, here are the key traits that are common with all of them.If you would like me to do more of these videos, give me a like or leave me a comment. 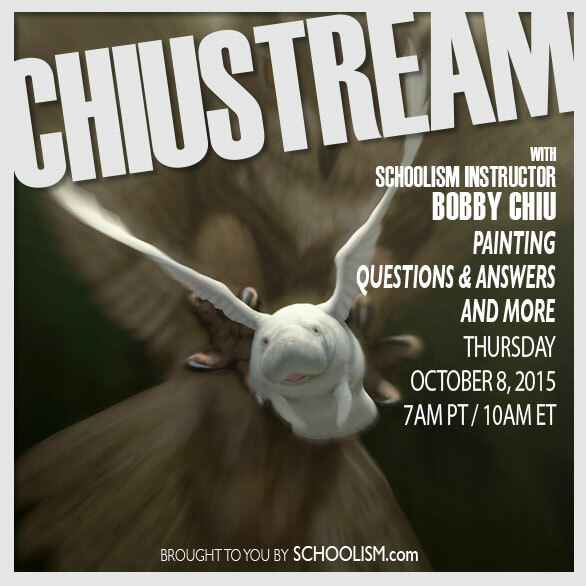 March 2016 Chiu's My Own Adventures took us to Schoolism Live Art Workshop in Florence. Kei (Acedera) and I (Bobby Chiu) were very honored to have our friends Ryan Lang and Helen Ming Jue Chen to join us. Both Helen and Ryan are incredible artists having worked on such films as Wreck-it-Ralph, Big Hero 6, Marvel's Dr.Strange and many many many more. Drawing, painting, talking about art and chatting it up with the crowd and taking questions. Hey everyone, 2000 Schoolism Subscriptions now available! If you're interested in professional art education, I highly recommend this. Last time subscriptions were available, it sold out in 5 days. Want to help spread the word? 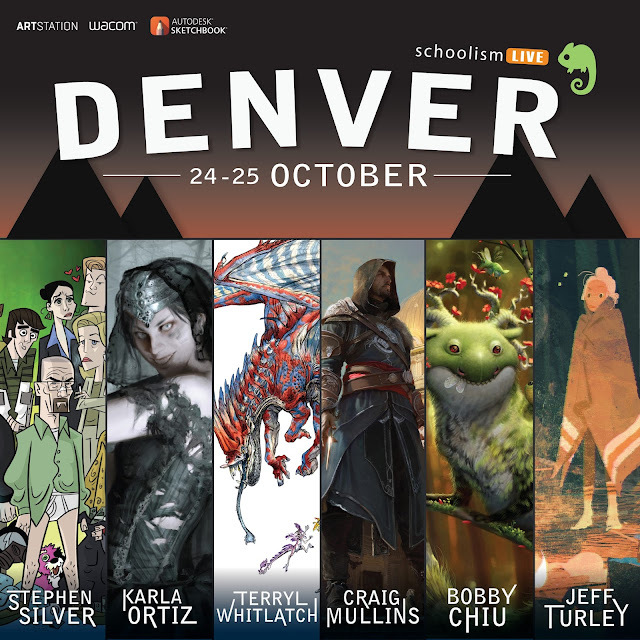 Share our post on FB for a chance to win a 1yr Schoolism Subscription. Winner to be announced on Wednesday. Oddworld Creator Lorne Lanning interview. One of the founding members of Oddworld Inhabitants in 1994, Lorne Lanning has been at the helm of the critically acclaimed fantasy realm, Oddworld throughout its long and storied existence. CLICK the banner above to see Bobby Chiu interview Lorne on what it's been like to be involved in the digital painting, computer graphics and video game revolution over the past 20 years. 1 - "No" really means "Not right now." One of the most important things I’ve learned about opportunities is that the people that receive the most, and I’m counted in this, are the people that don't take no as final. We’re okay with getting a harsh no, or a few of them. When rejection happens, learn to put a smile on your face, go back, reassess, and come back with a new approach or completely new portfolio. If you know in your heart that you are willing to take ten harsh rejections without giving up, then most likely you won't have to. 2 - Don’t sit waiting for your ship to come in. One thing I see all the time that I think is unfortunate is that many artists wait and wait for the perfect job. Here’s my advice for that, just go and do it! Just go pretend. One of the things that helped me starting out before we did Alice in Wonderland, was pretending that we were already working on a Tim Burton film. Every project we had that was close enough, we’d try to make it complementary to what we thought would be cool in a Tim Burton movie. You can’t just sit there saying “I wish” and “I imagine” unless you’re doing it in a way that helps you get to that destination. That’s what helped me with getting on Alice in Wonderland, thinking about it all the time, but also always working towards it. There is something to be said about waiting for your dream job. Just don’t sit there and do nothing. I think not enough people wait for their dream job in a way. They take the first jobs that come to them that are half-decent and go with that. That’s what happened to me way back. I took a job working on a television show that I didn’t particularly like the style or quality of because I had just got out of school and that’s what they tell you you’re supposed to do. Did it help excel my career? No, it was like a sidestep, or even a backstep away from my goal. So only take jobs that move you towards your goals if you can help it. You can’t settle, especially nowadays. Things change so rapidly in films, games and art. It evolves every year. So you have to adopt the idea that you’re a life-long student. Because if you’re not advancing, the world is going to advance right past you, even if you’re successful now, it’s going to be hard for you ten years from now if you don’t keep learning. Every couple years we try to take a month or two off to do a gallery show to strengthen, improve and evolve. And right now I’m trying to gear my schedule so that I can take more courses. You know, before when we were starting Schoolism, I was able to take all the classes. Recently, because we’re doing more things, we’re traveling a lot more, it’s harder. But I gotta stick to what has gotten me to where I am which has been learning constantly. And I gotta make time and get back there. You can’t keep drawing if you don’t stop to sharpen your pencil every once in a while. 4 - Start a landslide. Taking opportunities leads to more opportunities. For example, how did I meet Glen Keane, my all-time artistic hero? I took an opportunity to go to Angoulême, France to set up a table at their annual comic festival. I don’t know French, but I heard it was a good opportunity, so we went. And we met these two gallery owners who are now some of our best friends. Jean-Jacques Launier, and Diane Launier. They own a gallery named Arludik. Years later, at CTN in Burbank, Jean-Jacque and Diane were there and we were there and they introduced us to Glen Keane, and then later, we did a gallery show in Paris and Glen Keane came, and we talked a little bit again, and then through opportunity again, because I knew John Carls, a producer on Rango (2011). We’d spoken a bunch of times but never worked together, but we were very cordial to each other. He was organizing a talk in Savannah, and he invited Glen Keane and I, and so I was on stage with Glen Keane and got to spend a couple days with him. Some people, they just do their convention, or their show, and then they go home. Some people don’t make friends at school, they don’t even know their classmates names, and if there’s one way to lose out on opportunities that can change your life. That’s it. 5 - Live in a way that generates more opportunities. The best way to make opportunities come to you is to gear your habits and your principles in a way that helps you come across more great opportunities. For example, always try to meet new people. If you’re always trying to meet new people, and that’s a principle you live by, then guaranteed, you’re going to have more opportunities. Don’t do anything unless you think it through and it makes sense to you. If it makes sense to though, then you have to do it. Get into that mindset and promise yourself that if you know it’ll be good for you, then you’re going to do it. Just like education. Some people might think, “Oh yeah, that would totally help me, but I don’t have the time.” Maybe because the person isn’t making enough money, but the thing is, if they had more skills, they’d make more money! The main thing is, you gotta do the things that make sense to you. For example, our Kickstarter is almost done, and if you pledge on the Kickstarter, you’re actually going to get a better price then you would when we launch the subscriptions on Schoolism. https://www.kickstarter.com/projects/bobbychiu/schoolism-subscriptions-art-education-made-afforda If it makes sense to pledge for education from the industry’s best for as little as $10/month, you gotta do it! It would be crazy if you don’t because these opportunities will pass you by if you keep waiting forever. At some point, you gotta pull over so that you can sharpen your pencil, and get back in the game.